It’s funny how one event can become the catalyst to change your life. This was the case in 2010 when that unpronounceable Icelandic volcano erupted, throwing airlines and air travel into disarray. I was in England visiting my family and couldn’t return to my home in Spain. What had seemed like a slight inconvenience, turned out to be one of the most important periods of my whole life. Spending extra quality time with my grandson, Ashley, the seeds of ‘Learn with Alex and Anna’ were sown. Telling him countless stories, I was rewarded each time with: “That was a great story, Granddad”. From this point, my stories for children began. Living in Spain, I joined Wordplay Writers, engaged an editor, taught myself to draw, designed the book, learnt how to format, then self-published. Hey presto, six years later, fourteen books have now been published and printed. The Learn with Alex and Anna series of stories are essentially educational, and through them your child will discover lots of new and interesting facts, concepts and information. Each story is written around a basis of positive family and personal values. They are not gender specific, and offer challenging words to enable children to stretch their vocabulary. Written for children six years plus, they encourage grownups to read to their children, to learn things together. As a child’s reading age improves they can read the stories themselves. Older people with learning difficulties and a young reading age could also benefit from these books. 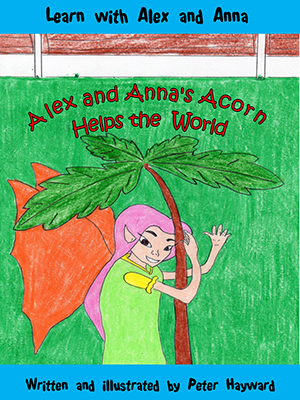 Alex and Anna’s Acorn Helps the World: Children discover the importance of trees for humans, wildlife and the fairies, and how photosynthesis works. ‘Excellent line of children's books that is not only educational but easy to read and follow. Great for families and children as it teaches life lessons on family, keeping our world clean, sciences, and wildlife. Our grandchildren enjoy the books as much as we enjoy reading to them. Simple, true and good morals for children to learn’. 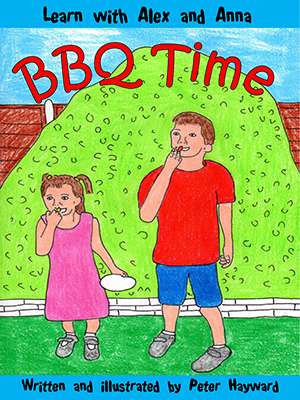 BBQ Time: Children learn how too much sugar affects teeth and health; to eat a mixture of nutritional foods; the importance of exercise to prevent bad health, obesity and diabetes. ‘Many thanks for BBQ Time. It looks great. Good luck with what looks like a great resource’. "I like to read Learn with Alex and Anna books because they are interesting. BBQ Time is one of my favourite. Since I have read this book I have started to eat more healthy food." 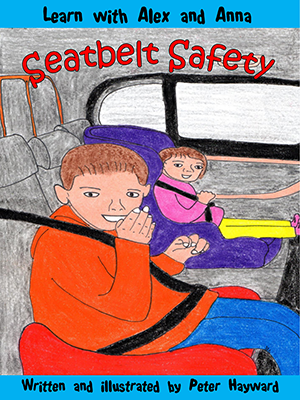 Seatbelt Safety: Educates children about seatbelt safety; empowers children to ensure their driver travels at a safe speed; instructs children to alight onto the footpath. ‘A nice story using positive reinforcement. Excellent to mention about getting out kerb side and why’. HRH Prince Charles and The Duchess of Cornwall, sent me a lovely letter wishing me every success. The Dept. of Education: [we] ‘are always interested in authors who aim to improve the educational experience of children’. Ashley and Lilly hope that through their, Learn with Alex and Anna stories, your child will have just as much fun learning, as they still do, while growing up. My website provides ongoing relations with children’s charities, hospitals and schools. One primary school is using the books to help vulnerable families.